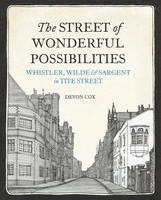 For Wilde, the street was full of ‘ wonderful possibilities’, while for Whistler it was ‘the birthplace of art’, where a new brand of aestheticism was nurtured in his controversial White House. Modern masterpieces flowed from the studios and houses of Tite Street, but this bohemian enclave had a darker side. Here Whistler was bankrupted, Frank Miles was sent to an asylum, Wilde was imprisoned, and Peter Warlock was gassed to death. The absolute love of books which this shop engenders is hugely joyous.